At the 5th RK Day hosted by Library and Archives Canada (LAC), speakers from LAC and the consulting firm OSTA (On Second Thought Advisory) gave an overview of the methodology including some background, why it’s being done, and some of the benefits. I’ve provided here a brief summary and some thoughts. Disclaimer: Please note that this is a personal explanation and may sometimes involve interpretation based on my own understanding and experiences. This is not an authoritative guide in any way. 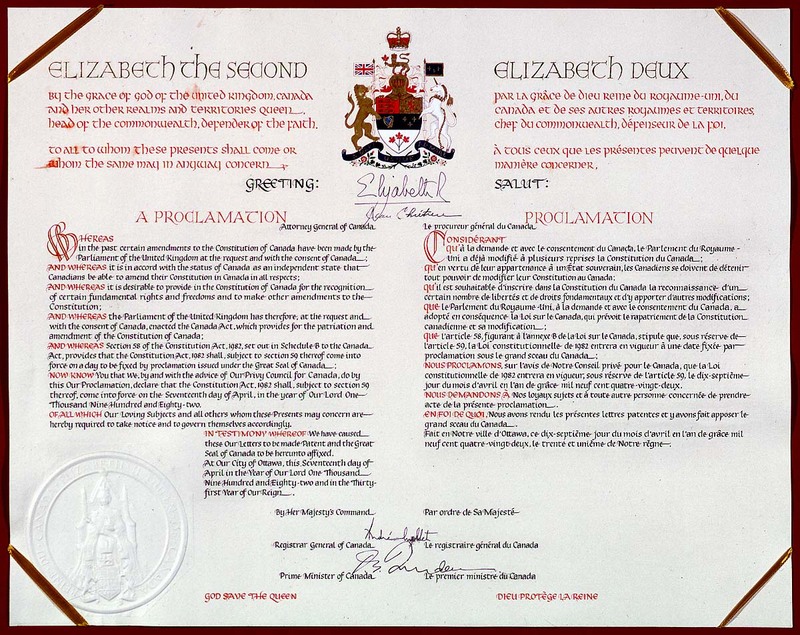 Links used here are not necessarily the most detailed or most authoritative links, but are used here because most documentation is internal to the Government of Canada. As always, opinions expressed are my own. culture change to convergence of policy, technology, etc. The initiative goes hand in hand with the policy that has been created. The Treasury Board of Canada Secretariat (TBS) put into effect the Directive on Recordkeeping a couple of years ago mandating that all government departments need to be compliant by 2014. New terminology: Information Resources (IR) to encompass everything instead of just records. Focus on value: Business Value (BV) and Enduring Value (EV, what is more or less equivalent to archival value) instead of by format or medium. Valuation is at time of creation not at the time of disposition or later. Prioritization at a high level based on existing plans and structures of the department means that it is risk informed. General valuation disposition tools (GVDT) that allow LAC to apply a disposition authority (RDA) to multiple institutions as a template with flexibility to ‘customize’ it for departments that need it. e.g. 60+ RDAs to 8? GVDTs to cover the same amount of IRs (don’t quote me on these numbers though). The RK methodology focuses on using what the department already knows and has, and implementing everything based on existing knowledge, resources, and tools while filling in any gaps. So, if a department already has everything more or less in place, the project should take a relatively short time. I’ll give a brief overview at a very high level just to give people an idea of what it’s all bout. There are a lot of documents, questionnaires, spreadsheets, etc. related to each stuff which they talked about at the presentation, but I won’t go through all of them here. High level analysis is done at the department level to see where the department stands in terms of recordkeeping. There is an Initiation Survey, which is supposed to be a quick (approximately 15 yes/no type questions) assessment of the department’s current practices. A more in-depth Diagnostic Tool allows an analysis of the readiness and complexity of the project for the particular department as well as an initial evaluation of time and resources requirements. More questionnaires and reports build on these in looking at the current state of things, prioritization, building a project plan, and a memorandum of understanding (MOU) with LAC. If the diagram confuses you at this stage, it is essentially supposed to show that the steps are non-linear as things go back and forth and an organization can be in multiple steps at once. Allow me to explain. Step 2 mentions engagement and of course, the department will begin the project, and with LAC’s assistance, focus on the highest priorities. Communications and presentations will be made to the department. Along with awareness and training throughout this process, obviously, documents to help staff on identifying information resources that have value and what to do will be created. Once into Step 3 (Data Collection Exercise), more in-depth questionnaires are done at the sector level focusing on value, controls, risk, and capacity. Particularly for large organizations, those working on the project will have to engage each sector to collect information, and depending on how quickly one sector is completed at this step, they may move forward to the next before another sector. Step 4 build reports and essentially an inventory of repositories, records, information resources, and what controls are in place to manage the information. Supporting documentation is also created with rationale on how to identify what information resources are of business and/or enduring value. Step 5 puts it all together into one spreadsheet (Recordkeeping Accountability Instrument) listing program sub activities and outcomes, whether it has (or likely to have) business and/or enduring value, which disposition authority applies and how, and who holds responsibility among other things like security and risk (but I have listed the essentials to give the general ideas). This spreadsheet would become a reference document for all staff, particularly those involved with information management (in any way, not necessarily in the IM branch only). Other documents are also created at this stage to identify any gaps and actions to address these gaps. Recordkeeping roles are also identified and committed to by the department. Plans are also created for the final phase. Finally, the department is to maintain the reference materials and follow through on the action plan. Results are reported, information is managed, change is monitored, and things are revised as needed. There are others, mostly surrounding information and records management, and some which are more related to the archival side, such as preventing lost of information with enduring value. Certainly for anyone in the Canadian government who was not already aware of all this would be most interested in the expected timeline. Initiation surveys have been sent out with the diagnostic tool available this month. Selected departments will be contacted to be early adopters and begin the project. LAC will also be training their staff and certifying consultants. LAC will be getting all departments through phase 1 by the end of the year with early adopters moving into phase 2. Projects will begin in clusters of institutions (presumably similar ones will be grouped together). LAC hopes to finish by June 2014 in order for all departments to be compliant with the directive by the ‘due date’. Sounds very ambitious, but it also sounds like they thought it through. One can only see if it works out, I hope it does! The event itself was well organized for the most part. There was definitely a good turn out. I think there’s room for improvement for the next time they do something similar though. Considering the audience and that most people will not have been exposed to the methodology before, I thought the presentation went into a bit too much detail at times, overwhelming some. Talking about the tools at a high level is great, but showing people unfamiliar with the project an actual spreadsheet struck me as something that would simply confuse people. The presentations were also done in both English and French. I understand the importance of having the presentations in both languages, but considering that most people are bilingual, hearing each slide done first in English and then in French is repetitive to most. If the presenters are worried about presenting in someone’s primary language, is it not common practice to simply have two presentations, one in English and one in French separately? On the upside, I got to learn some of the French vocabulary related to the project, which I had not been previously exposed to. Nevertheless, overall, I think the presentations were well organized, and the presentations on presenting the rationale for the project and the timeline were definitely well done, giving people a good sense of why the initiative is happening and how LAC will lead the departments into compliance. Attending the session really helped me get an overview of the methodology and to put my work into context. Having entered the RK Project in the middle of the pilot made it so that I had to do a lot of catch up work, and unfortunately, I will not see the department complete phase 2 either. The overview gave me the big picture of the project as well as informed me on the status with the rest of the government, which was great. I also go to report back to our team with the information that the presentations were done in both languages, which I think will be of use to us. 580 takes care of Energy, and Policy and Management. Not much to say beyond that. Standard compact shelving with a small meeting area and some nice art. It has a nice reading area with cushy chairs! Half of Earth Sciences resides at 601. 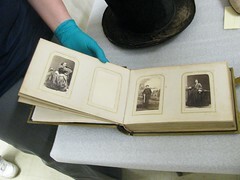 They do have a large collection of physical materials, particularly serials, with different numbering systems as well for material catalogued before and after Library of Congress was in use. In terms of things to show off, the 615 Booth Library probably has the most. As the other half of the Earth Sciences collection, they have all the Geomatics related material, the maps collection, the photo collection, and the books archive. They have some great photos going back to the first photographically documented geological surveys. There also a ton of maps as well as some interesting globes, including a tectonic plate globe with moveable pieces! The books archive has a number of pieces written by Logan himself. 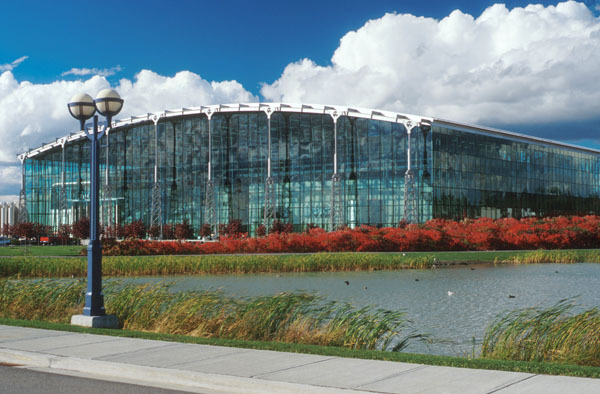 All the NRCan libraries are open to the public, so feel free to visit and browse the collections physically or virtually! Yesterday (Wednesday), we got not only a tour, but also a big talk on the various services and projects that NRC Canada Institute for Scientific and Technical Information (CISTI) is working on. For those who don’t know who they are, most people would know them as the National Science Library. The library itself is fairly standard, except that it’s not open even to staff. They have three floors of closed stacks (which are fairly narrow to save space), so only library staff are generally allowed in. Any access is done through digital scanning of articles or by providing an electronic source. Generally, what they have in print is the older material, and newer material is electronic only (that’s my understanding anyway). The artwork in the building was nice. One wall on the ground floor is a 365 plexiglass boxes wall (sorry, no picture, it turned out blurry). The other notable piece is the waves design (by a Japanese artist), one which is turbulent (picture in slideshow), the other which is calm. So, depending on your mood, you might go and look at one or the other. They provide a lot of services to both internal and external clients. Mostly through document delivery. Interestingly, they currently have a partnership with Infotrieve, whereby Infotrieve can use the facilities in return for doing the day-to-day operational services, such as circulation and document delivery (including scanning). This has allowed CISTI to provide better, faster access to their information, and its more financially sustainable. They also have partnerships with other libraries, such as Health Canada, and they are participating in many national initiatives. Obviously, they provide reference services as well, mostly in terms of more complex questions with a focus on “actionable” information. Maybe because I’m a techie, but I think some of the coolest stuff they’re doing at CISTI is shown on CISTI Labs. The recommendation search (Sarkanto) is pretty neat, and so is the coloured cluster searching (Ensemble). The problem, of course, is the uptake and getting people to use it. Still cool. Recently, they also launched their mobile site. The number of GC sites that have a mobile version are few and far between, so it was great to see. They even have a parred down version of their link resolver page for their internal mobile users. Great job! So I briefly talked about the Library of Parliament in my Doors Open (Part 2) post, but Tuesday, I got to go on a private tour (it was just me and my coworker) getting more history and information on the library. The library provides a lot of services, primarily reference and news collation, but the research department also create internal reports, briefs, and publications for House and Senate members. More on their services can be found on their website. As to be expected, a large portion of their collection are legislative and legal in nature for federal and provincial, as well as other commonwealth nations, particularly the UK. Obviously, there are also a lot of parlimentary documents including committee decision and evidence, and copies of MPs’ Questions and Answers. However, since they don’t have a lot of space, in terms of more contemporary reference material, they only have a specific range (E-L? I thought) with the rest in storage or at other locations (which apparently total 8). 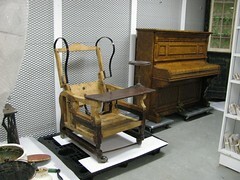 Most of it was kept on the main library floor or in the basement using compact shelving. Most of it was pretty standard, but they had some neat shelving for microfilm. You will also notice that some books have new binding and some old. We were told that that’s because they are focused on preserving content and not necessary the book itself, so if the book is brittle (especially if it was printed on pulp paper), they might even photocopy the pages and bind them into a new book. Rare books are probably exception to this. The library has some really interesting pieces including old books about Canada printed in Europe in the 19th century, and early copies of exploration books. Their rare books has very restricted access though so we unfortunately didn’t get to see it. I previously mentioned that the library is the only surviving part of the original building, but on this tour, we got much more information on some of the smaller details. Due to remodelling, renovations, and whatever else over the years, the library was changed a few times. However, in most recent years, they have been trying to restore the library to the original look. The railing was painted almost all black in the 50’s, but they now sport a bit more colour. The glass floors and on the tower-looking structures were also ‘put back in’ so to speak since in the 50’s they had made them all wood. Can you also imagine how bland the ceiling would look if it was all beige? Well in the 50’s it was, so they repainted it with the blues. The library also has square wood cuts along the walls, each of which is unique (100+). The reading room is an addition though, since the original reading room is now the largest party’s gathering room. Additions were also made to make sure the building was following building codes and to help with overall maintenance/survival of the library and its books. So, brass windows were custom made for all 100+. Apparently in the past, the windows didn’t always keep out the rain especially during high winds, so they had to use tarps to keep the water off books! Some of them have evidence of water damage now. Ventilation and fire sprinklers were also added, but in an inconspicuous way so that they aren’t really noticeable (took me 2 minutes to spot a sprinkler even when it was pointed out to me). The one thing that was removed was the card catalogue along with one wall of drawers in each area, which is a bit strange though since they left the side walls intact. It was a great tour and if people get a chance, I would highly recommend it! I had a fairly eventful National Public Service Week last week. To begin with, there was a ‘kick-off’ event here with a video in honour of public servants. It was interesting to watch, because although I realized that the government does a lot for the country, it helped me realize that literally all sectors of our country likely have a related government department or agency (beyond finance/taxes). To celebrate NPSW, our communications branch (I believe) set up wiki pages (via yours truly and coworkers) for people to add comments thanking other people’s hard work. I am proud to say that I added a comment as well thanking everyone, particularly the team, in helping me get settled in. I also greatly appreciate my coworkers putting up with my newbie questions. Wednesdays of last week was a #w2p event and it was great. My first meetup with the group (since I missed the last one at the War Museum). I didn’t know anyone there, but the hosts were really friendly and so were all the other people I met. It was nice putting faces to names. I found it funny that half the people there either work or worked at NRCan at some point. A lot of good discussions and finding out what other people are doing. In particular, the accessibility web work that’s happening is quite interesting. I was also introduced to the @UXWG which is a government working group coming up with web guidelines. See Laura Wesley’s blog post summarizes UXWG. YPN organized an interdepartment mixer to encourage people to meet with young professionals in other departments. I was a little disappointed that it wasn’t a little more structured. They basically provided a place and time, but that was it. No introductory remarks, no ice breaker games, nothing to encourage people to actually mix. I was happy that I met new people from another department, but they were essentially coworkers of acquaintances. Still, it was great fun meeting other co-op students I hadn’t met before. So, that was my NPSW. I’m glad I took the opportunity to go out to as many events as I could manage. It makes me all the more thankful that I had the opportunity in the first place. Thanks GC! For the full list and a map with the actual order I visited places in, see Part 1, the previous post. I think the Hungarian Embassy was the highlight of the weekend for me. It’s a smallish place as far as embassies go (is my impression anyway), but it had a great atmosphere and look that I really liked. 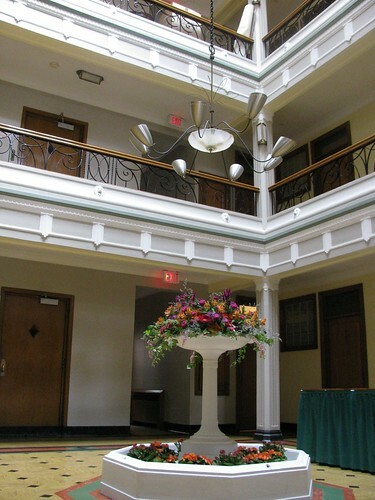 The house part of the building was restored to the original look including all the wood paneling and ironwork. It was elegantly decorated. The study had a cool map of Austria-Hungary (from 1867 I think it was). The dining area had a small table set up with photographs of traditional Hungarian dishes. Best part was when one of the other visitors asked if the beautiful china was used for formal or special occasions. The response from the staff, “No, no, he uses it everyday.” I went early (just before it opened) so I got some pictures without anyone in them. Honestly, I only stopped here because it was on my way to Blackburn after the Hungarian Embassy. There was really not much to see. I was hoping to see their organ, but it was behind a wall. Oh well. So the Parliament library inside the Parliament you can see if you got on a Centre block tour. The Sparks St. one, however, I believe is not normally open to the public. (Apologies for the quality of the pictures, but with the sun coming through the windows, it wasn’t easy.) The statue of Queen Victoria stands tall more or less in the center of the circular room with walls of books. At intervals, there are large wooden towers with the coat of arms of the 7 provinces that existed in 1876. It’s the only part of the original parliament that wasn’t burnt down, so it’s quite special. I spent little time at the Sparks St. Parliament Library, but I took a couple of pictures. It’s housed in the old Bank of Nova Scotia done in the Beaux-Arts style, so it has a nice open atmosphere to it. It’s quite grand in a modern way, and rather impressive, though I found the one in Parliament more interesting. Maplelawn was really nice. How often do you see a (what used to be private) acre garden in the city? It actually had a lot of flowers that I don’t remember seeing elsewhere (at least not in bloom). It was great to just get “out” of the city for a little while, especially out of the downtown/core area. One of the volunteers even cut a few flowers and gave it out to the ladies. The Keg Manor is the house next to the garden where the original family lived. 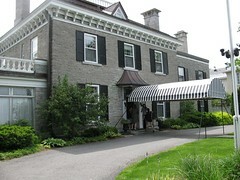 It was originally owned by the Thomson family, but is now called the Keg Manor since it houses the Keg Restaurant. It was nice to see the inside since even if you were to dine there, you don’t exactly get to wander around. The National Capital Commission (NCC) is housed in a restored building. Apparently, it was so old and unmaintained that it was pretty much falling apart and unlivable. However, they didn’t have enough money to get it restored, so they made a deal with the management company that the company would get a fixed number of years ownership and would get all profits during that time before it was given back to the city. The paint colours and everything were restored to the original based on shaving down the layers, historical documents, etc. The style of the building is a really interesting mix including Japanese tea rooms (seen in the railing). The offices that lease that part of the building are really allowed to do more or less what they would like as long as they restore it to the original when they leave. This is where they house foreign dignitaries and it’s pretty much right next to Rideau Hall. In a way, it’s just another house, except that it’s furnished with rather varied cultural decorations and styles. They also have their own chef! Unfortunately, no pictures were allowed on the inside. Rideau Hall is the Governor General’s house (and again you can’t take pictures inside, don’t know why). Heads of State and Royalty will stay here, so Queen Elizabeth II stayed in 2010 during her tour. The rooms were quite vast, obviously meant to hold large groups of people and for functions. The tent room was especially neat since it’s an indoor room but is made to looks like you are inside a colourful tent. The highlight of my visit though was seeing Glenn Gould’s piano. This church is probably one of the nicest I’ve seen in Canada. It has a grand but not overwhelming sense of presence to it (it’s hard to explain). The organ was impressive especially with the stainglass behind it, which would have made a very nicely framed picture if I had a camera that could have captured it properly in the kind of lighting I was working with. What I liked most though was the triple altar with its nice paintings. Of course, I have yet to visit the Notre-Dame in downtown. No pictures. I just stopped by here since it was on my way to the bus stop. It was interesting though not art that I would purchase regardless of the rather high prices. On the up side, they had a bit of free food and wine! (though I opted for perrier since it was the middle of the afternoon.) The cottage itself was really small, but cute. The garden was made for lounging. The Supreme Court of Canada was a really interesting place to visit, especially with the speakers who were there to talk about how everything works. It was educational learning about what kind of cases would be heard and that each side only has one hour to make their case unlike in lower court proceedings. The Federal Court of Canada is in the same building, and thought I could have guessed, I didn’t know that criminal cases are tried at the federal level, but only federal crimes, such as treason and terrorism. Phew~ Finally, that was my Doors Open Ottawa 2011 experience! It was actually two weekends ago now that Doors Open Ottawa 2011 happened (June 4-5). Although it doesn’t quite fit in with the usual library related things I post, it was too cool of an experience not to blog about it. This was a neat little collection of various furnishings and other items that are part of the Billings Bridge collection (exhibited at times at Billings Bridge Estate. I admit that after seeing the LAC Preservation Centre, the storage facility itself was not particularly impressive, but they definitely thought it through (complete with raised floors, humdifier, temperature control, and flood detectors). Nevertheless, as they recently redid the museum to be less showing of what it was like in the old times to more interactive screens/videos, it was nice to have the opportunity to see some of Ottawa’s history. The Blackburn Building is really just an apartment building, but the indoor courtyard done in the Art Deco style was neat. Bytown Museum was very interesting as the tour guide gave us a quick history of Ottawa, focusing on how Ottawa started as Bytown, the building of the Canal, and then how it got renamed. In doing so, she also talked about why the Bytown Museum (which was a warehouse and guardhouse) is the only building in Ottawa in the Georgian style architecture (though not quite true to it). Apparently, the Rideau Canal took so long to build, by the time it was done, the Georgian period had passed. 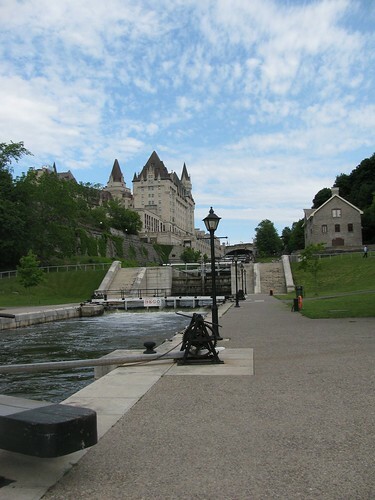 While there, I also happened to see one of the Rideau Canal gates open and close. Not something you see everyday! This is actually restored building done in the Georgian style as the original was burnt down in 1978. It mostly has offices with some retail on the ground floor. This was another building that had balconies and walkways indoors (much like Blackburn), plus some neat lamp decorations. C.D. Howe is the Public Works and Government Services Canada (PWGSC) building with retail shops on the lower levels. 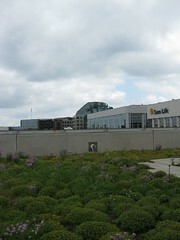 The building itself, however, was not the point of visiting the building, but rather to see Ottawa’s first ever green roof. The initiative is great for not only having a nice place to lounge with greenery for wildlife, it also helps to reduce energy use and the heat in cities. The Delegation of the Ismaili Imamat building was really neat. Of all the modern buildings I saw, I think I enjoyed this one the most. Other than the impressive dome, the metalwork you see around the foyer area is inspired by Islamic art created as a sort of screen where it is easy for those on the upper floor to see into the open space, but difficult for someone on the ground floor to see up to the balcony-like upper floor. The courtyard was interesting too since originally it was supposed to have a fountain, but for whatever reason they could not put one in. So the architect found different ways to include water thematically. The courtyard floor is slanted so that water will collect in the center and drain away. The floor is even heated to accelerate the melting of snow during winter. The bushes are also shaped into a wave pattern so that when it snows, it becomes quite obvious. I hadn’t really planned on going to the Embassy of France, but I’m glad I did. It’s a modern building as you can see from the images. The tapestries were very impressive: very large, well made, and some are quite old. The wall sculpture decorations were very nice as well. I thought the mix of decor styles was quite interesting. My only problem with the experience was that I felt like part of a herd. Originally, I was going to post all the places, but the post was getting way too long. Stay tuned for Part 2. So our group actually went on this tour back on May 18th, but I somewhat forgot to write about it. I apologize for lack of pictures. We weren’t really allowed to take anything in with us, so the best I can do is describe it. Click on the image below though, they have a few pictures on their own site. The architecture is really interesting since it’s inspired by the Prairies. The towers look like oil rigs, and the various connected buildings in and outside look like barns or silos. The Centre itself is also separated into two sections. The inside vault is basically in a big cement block and then there’s a large hallway space with a glass building surrounding it. To give you perspective on the size, it’s two football fields big and could fit 2 boeing 747s if the vault wasn’t in it. 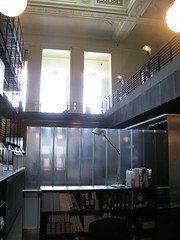 The inside has 4 floors of vault and then an open floor above for work areas. Each vault floor has numerous vaults separated into rectangular rooms much like most places that store materials. Humidity and temperature is different depending on the format of the material inside as to be expected. Audio/video is of course as challenge due to the shifts in format/technology. The paintings are pretty neat. There were a number of Laurier portraits, the Churchill one was nice, and copies of the original Proclamation of the Constitution Act. The original we’ve been told is in a top secret vault (no kidding). The top floor is the “village” where they have little huts with all the equipment they need to do restoration, preservation, and format transfers. They’re considered huts since they can be reconfigured (I imagine they don’t do it all that often though). Particularly neat was the page remaking process where they remake and fill in what’s missing of each page from a book, and also the cover remaking/rebinding. We got to watch a short video on the comparison between before and after a film restoration which was pretty cool. It was a very cool tour. It’s definitely worth going if you have time!